We last left off somewhere in Fort Collins, Clifford with his newly refreshed propane system thanks to the good folks at Rocky Mountain Westy. By the time we departed RMW and had the propane tank filled, it was close to 6pm. We had planned to be at our campsite at Collegiate Peaks for this night, but with the unscheduled activities of the day, that wasn’t going to happen. Thus, we aimed for Frisco, where we hoped to camp in the shore of Lake Dillon. It was a warm day. In fact, well over 30C warm. By now, Robin, Bruno and I had all somewhat accepted the non-AC environment of Clifford, so most of the concern was for Clifford and how he would do in the busy stop and go traffic through the greater Denver area and then on the long climb on Interstate I70 toward Frisco. Needless to say, I spent these hours repeatedly glancing at Clifford’s coolant gauge, hoping to see nothing out of the ordinary. The stop and go in the heat was worrisome, but the radiator fan seems to keep the temperatures in line. Once traffic thinned out and started flowing somewhat regularly, it was time to commence the climbing. 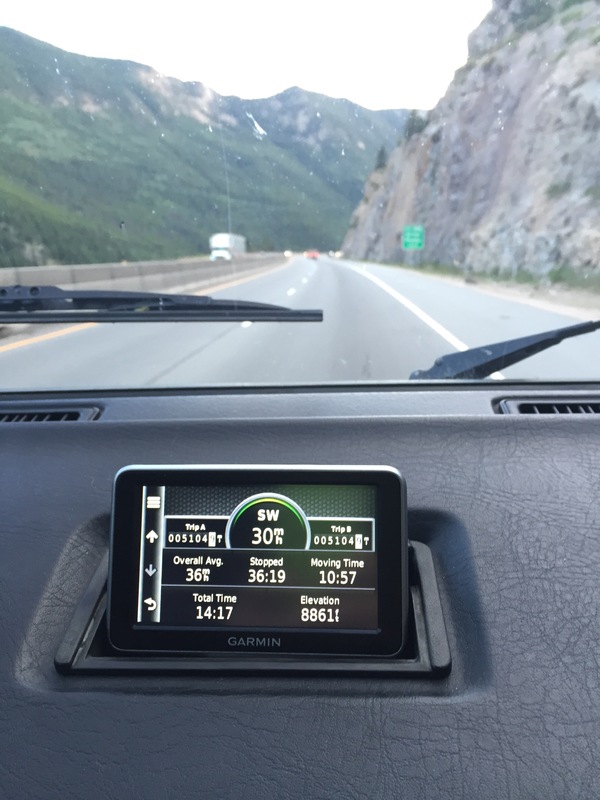 The long climb toward Loveland pass (over 11,000 feet altitude) was a mix of third and second gear efforts, where in the steepest parts we were moving at barely over 20mph (32.6km/h). At the slower speeds, the radiator fan would be on much of the time, for the speeds were not high enough for sufficient cooling flow. It was a slow crawl, but we succeeded. We actually even passed some slower vehicles, as cray as that sounds. The only part of Clifford that had true challenges on the ascent, was his flasher relay. The long continuos periods of four way flashing as we crawled up the slow lane if the interstate seemed to ever hear the relay and force us to turn it off for a minute or so before it word work again. We arrived in Frisco as he sun set, and we’re happy to find a camping spot for the night. We set up camp relatively quickly (we seem to be getting more used to the routine) and had a quick bite of dinner and maybe even a beer before heading to bed. Next morning, we woke up to beautiful Colorado sunrise. A cold sunrise, but easily better than the scorching heat of the previous day. 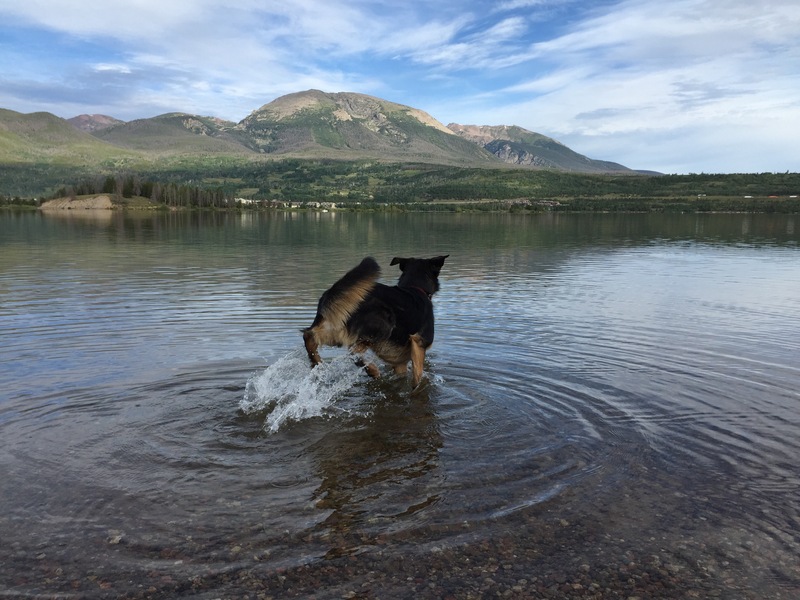 We did a little morning hike with Bruno on the shores of the lake before packing up and aiming Clifford towards Buena Vista and Collegiate Peaks campground. On our morning hike, we saw another Westfalia across one of the lake inlets and instantly recognized it as Babe. Our friends’ Peter and Andrea and their Westy Babe had also arrived in Frisco on the previous day and we were happy to see them. 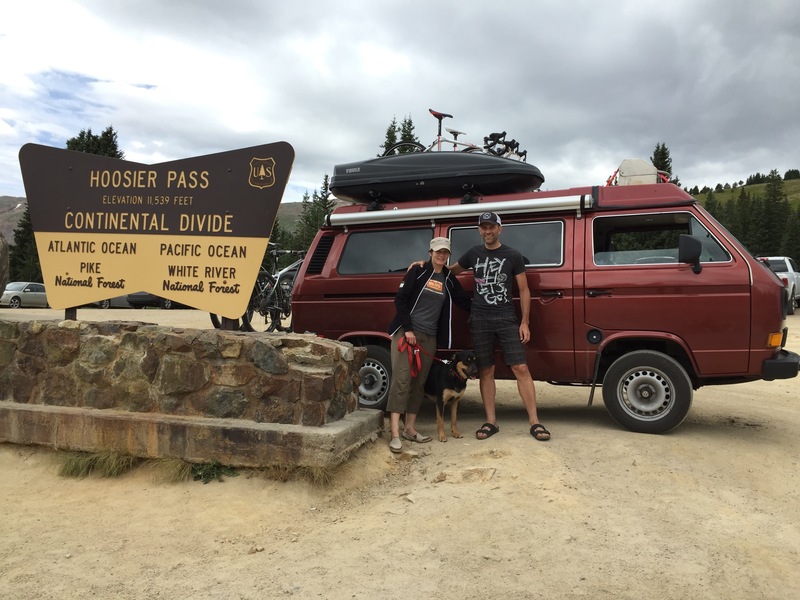 We left Frisco and headed for Hoosier Pass on route to Buena Vista. By now, Clifford was a veteran of the mountain passes, so we had confidence for our journey to the top. Our success was never in doubt, but it took a number of first gear efforts to get up steep inclines and hairpin turns. It was all worth it. 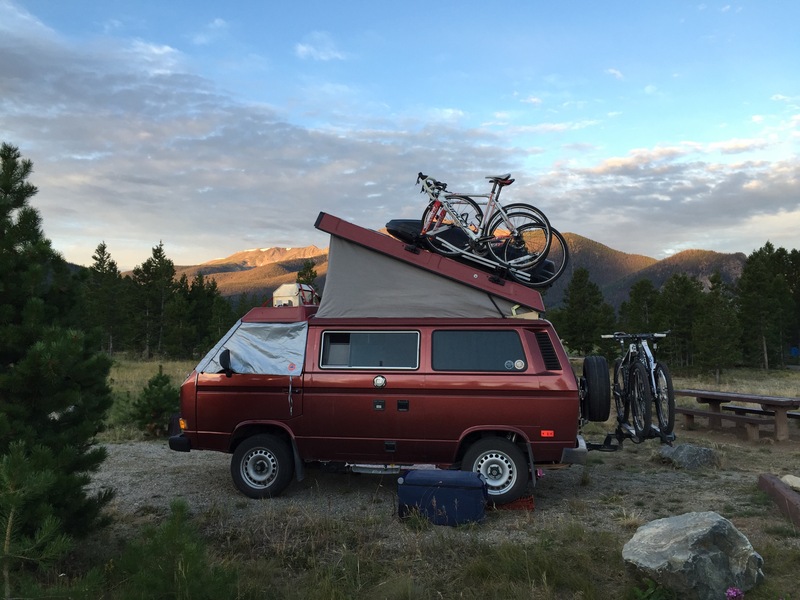 Next time, camping at Collegiate Peaks.